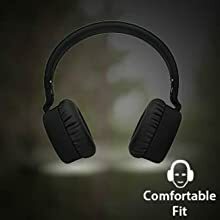 Buy Boat Rockerz 430 Wireless Bluetooth Headphone (Black) @ 43% Discount. Now, take pleasure in boAt Rockerz 430 Wireless Headphones & stop worrying about the problematic wires. 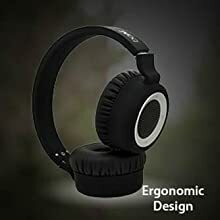 Sooth yourself while listening to music in a high-quality audio reproduction. Poor audio quality can kill your vibe. The boAt Rockerz 430does the insane, it comes with a remarkable sound technology that ensures deep & powerful bass to take your music to a whole new level. The Rockerz 430 will meet all your requirements with its amazing features & efficiency. The Rockerz 430 is a masterpiece, hear the finest details with powerful bass, warm vocals & precision highs for a wholesome aural experience. So, Get Going, Get Young, Get Inspired. The boAt Rockerz430Wireless Headphones will make your listening experience personal and for real. Our Signature Sound Processing will generate one of the greatest Sound Experience you could get from a headphone. Premium CSR8635 Chip, powerful 40mm dynamic drivers with speaker resistance of 32 Ohm enables the headphones to deliver rich sound, punchy, rhythmic response to the most demanding tracks for a high-quality audio experience. 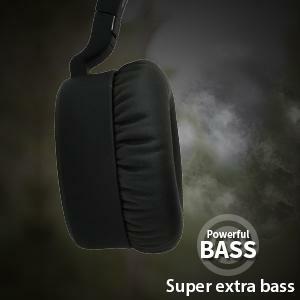 Feel the true High Definition clarity sound while the Powerful Bass makes you feel the constant waves at wide Frequency range of 20Hz – 20kHz. Revolutionary ergonomic elements in the boAt Rockerz 430 removes unwanted boundaries between the listener & their ardent involvement with music. Each perfect symmetrical interior part in the boAt Rockerz 430 is carefully designed right from scratch. What’s more? It’s lightweight, sturdy & uber premium. Rather than focusing more on style & fashion, we aimed to construct premium headphones with superior ergonomics delivering utmost comfort & wear. Perfectly crafted with precision, Rockerz 430 is one of our finest creations, & not compromising at all on the aural experience. Adaptable to every head, the headphones sport a foldable& adjustable headband made from high quality PU material. From the well-constructed adjustable headband to your soft cushion ear cups, this is not just a regular headphone, it’s a masterpiece. Unlike traditional headphones, the Rockerz 430 is created to compliment your lifestyle with its perfect fashion statement. Even the ear cups can move to easily fit your ear. Rockerz 430 is one of the lightest in its class, giving you optimal comfort & master control board to play/pause, change tracks, ans/reject calls control volumes everything on one place. 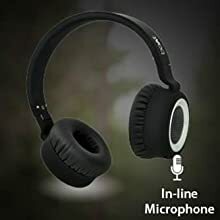 Apart from its young refreshing looks and uber premium feel, the boAt Rockerz 430 wireless headphones consists of a CSR 8635 chip with CVC 6.0 echo cancellation technology so you can make clear calls that are every bit as crisp and noise-free as the music you listen to on your smart devices. The Built-In microphone in the boAt Rockerz 430 is ideal for face time, Skype and virtually any application requiring a microphone. Always stay connected while you plug into nirvana & create memories. Whether you are plugged in or unplugged, you are always good to go with the boAt Rockerz 430 wireless headphones. Even after hours of extended wireless usage, the boAt Rockerz 430 will never fail in giving you the rich detailed sound experience you deserve with it’s dual mode wired and wireless connection. Simply plug in the included wire to a 3.5mm audio jack just in case you run out of battery and carry on with your nirvana experience. The boAt Rockerz 430 wireless headphones comes with a cable included so you’re all set right out of the box. Now just stop worrying about messy wires hanging from here and there. Connect with any Bluetooth device, Gear up and play. Dead Batteries can kill your vibe. BoAt Rockerz 430 is designed to play efficiently. Don’t just be loud, be loud and clear. We guarantee you have not heard such powerful bass and High Definition vocal clarity from a wireless headphone with Extra Comfort Ear cups. The boAt Rockerz 430 Wireless Headphones will make your listening experience a fulfilling one. So, just Plug it in and Plug into Nirvana. 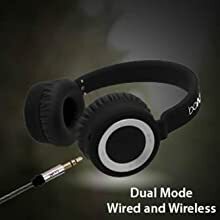 Best Cheap Deals For Boat Headphones, Grab Cheap Boat Rockerz 430 Wireless Bluetooth Headphone (Black) Online.